In this episode, I show you how I tackled the caged ball section of the Welsh Love Spoon. I started by squaring the outside of the cage and transferring the aperture opening to the other three sides. I then marked the diameter of the ball on the other three sides, but whilst doing that I found myself wondering whether or not the ball I’d drawn was the right diameter. After all I just drew a ball freehand along with the rest of the spoon. Should it be a certain diameter and if so, how big? I reasoned that the ball needed to move up and down freely in the cage, but that there shouldn’t be a lot of side to side play. 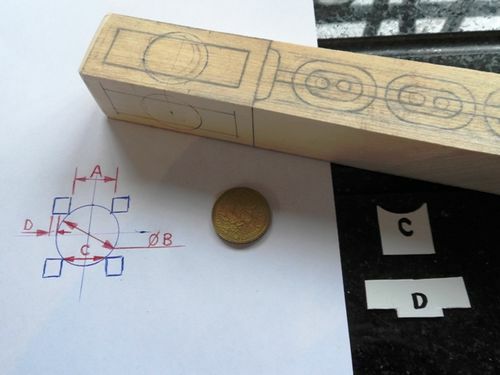 So I measured the width of one of the apertures (A) and drew a quick sectional view of the cage (as if I’d sawn through it and was looking down on it). It was then obvious that the diameter was the distance between the internal corners of two diagonally opposite posts (B). Needless to say the ball I had originally drawn was too small. As luck would have it though, a 50 cent coin (Euros) from my holiday change jar was exactly the right size. 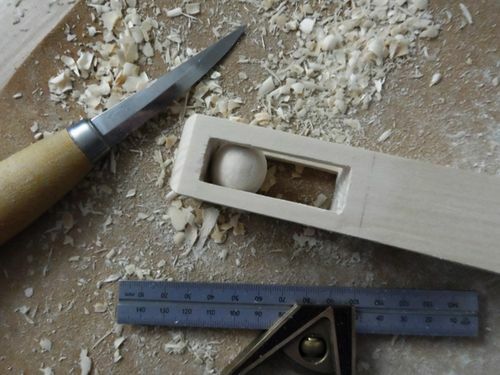 Having reassured myself that the ball was now the right diameter, I got to wondering how I’d know when I was at the right diameter once I started to chip away at the surrounding wood. 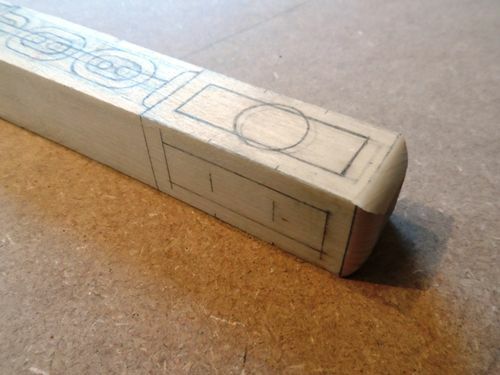 So I decided to make a couple of crude templates out of an old hotel card key. The depth gauge ‘D’ will let me know when I’m at the right depth from each face and the arc ‘C’ will help me keep the ball spherical. I decided to excavate the waste either side of the ball first and leave the ball intact for the time being. This would give me more space to maneuver my knife to shape the ball. 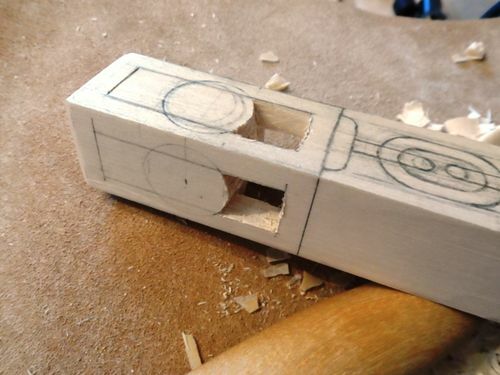 First I made two stop cuts to sever the end grain, followed by two along the grain on each face to define each aperture. Then I cut a knife wall so I had shoulder to slice into without cutting into any wood that should remain. I kept deepening the stop cut as I removed more and more chips. Once the inside walls of each corner post were as deep as the width of the posts on the surface, I stopped. Notice that at the moment I am effectively treating the ball as a cylinder when viewed from any of the faces. 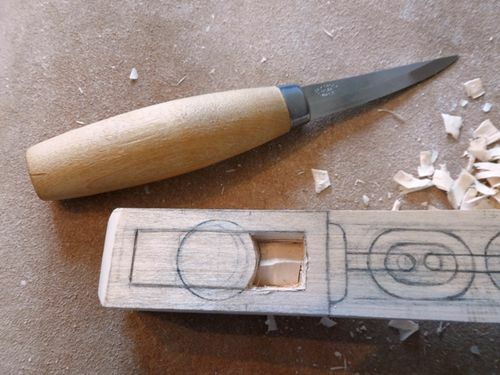 I was then able to get more movement on my knife and use my thumb as a fulcrum to slice through the end grain until the center piece popped out. Finally I could see daylight. Yippee!!! I then repeated the whole procedure for the other end. 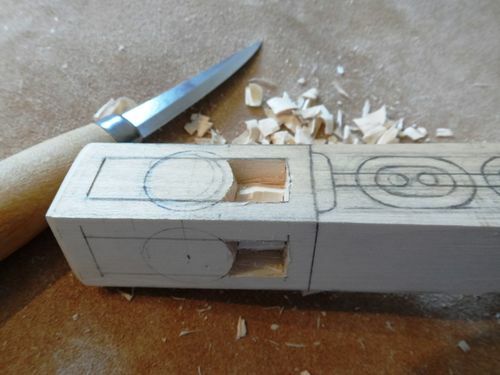 I must give a ‘shout out’ to the Mora 106 woodcarving knife. When I was in the market for a good carving knife, I looked at comparable knives made by Hans Karlsson (£53), Svante Djarv (£43) and Ben Orford (£60). All good knives I’m sure. However, I read an article by Robin Wood where he extolled the virtues of the Mora 106 (£16.95). Robin makes his living from green woodworking and knows a thing or two about knives. I respect his opinion, so I thought I’d give it a try and I’m glad I did. 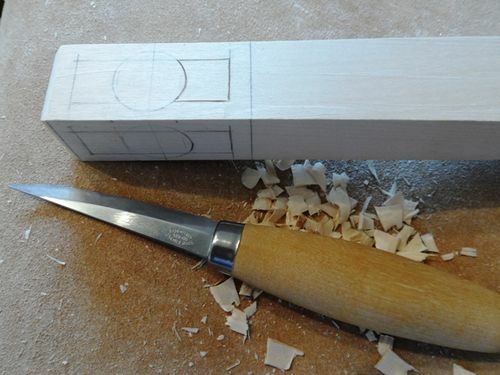 It takes and holds a great edge, is comfortable to hold and will tackle anything from aggressive slicing cuts to paring end grain or adding fine details. Let’s face it, there aren’t many cheap tools these days that surprise you with their performance, but this one puts a smile on my face each time I pick it up. 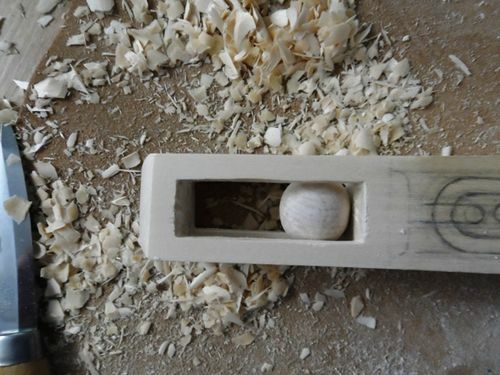 I’m afraid I forgot to take any photos of my progress as I carved the ball. Basically though, I just kept chipping away at it from each side and testing my progress with my templates until the ball became separated from the cage. I have to confess that I found this harder than I thought it would be, although I’m sure I could do a better job next time. The reason I found it hard is that although I was trying to carve a perfect sphere, I couldn’t actually see the whole sphere through any of the windows, so it was difficult to see where wood needed to be removed. Consequently, once the ball finally became separated from the cage, it was more like the shape below. The other issue I found was that once the ball was no longer joined to the cage, it was difficult to hold on to it while I further refined the shape. Still, better to take off too little than too much eh? I basically just kept sneaking up on a perfect sphere until I could rotate the ball in any direction without it binding. I still have a little bit of refining left to do before I’ll be happy with it. I’m so glad I decided not to carve three balls in the cage! Anyhow here is where I’m leaving it for now. I’ve included two photos showing the ball in different positions to prove it does actually move. Next I’ll tackle the bowl of the spoon. Sorry I got some of the photos in the wrong order. Now corrected. Well done Brit, very informative love the work you do. Thanks for taking us alng on this mission Andy. Its interesting to follow. Thanks for the review of the Mora knife. It looks Stainless? And very comfy to hold. I’d love to try this same procedure along with you! Just afraid my work won’t look so nice on the first attempt! You can do it Terry. The Mora 106 knife is made from laminated carbon steel with the core being hardened to 61-62 Rockwell. 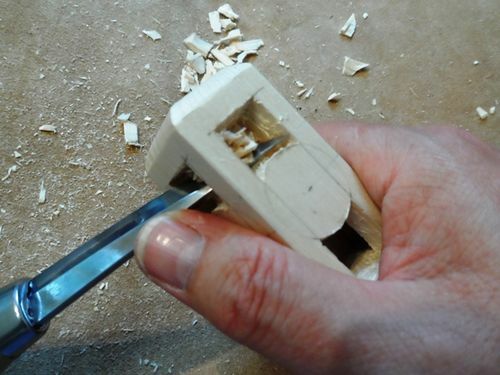 You might be interested to know that you can also buy the blade on its own, so you can make you own handle for it. Most impressive work Andy. I always wondered how people did this. ^ +1 and then some! Thanks for this blog/tutorial, Brit, it’s very interesting. I’ll probably give this a try myself. Well done Andy. You take us on some pretty cool journeys. Much appreciated. The templates were brilliant as was the blog explaining the process. Amazing job Andy. +1 Terry can do it. Nicely done Andy! 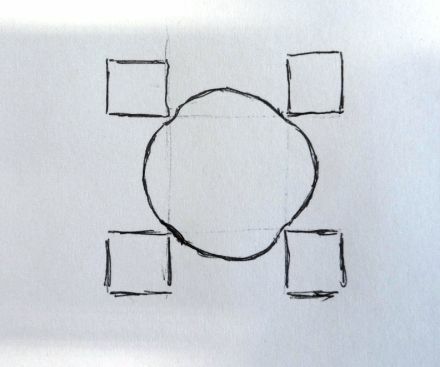 I can’t even draw a decent circle. Charles – Yeah have a go. 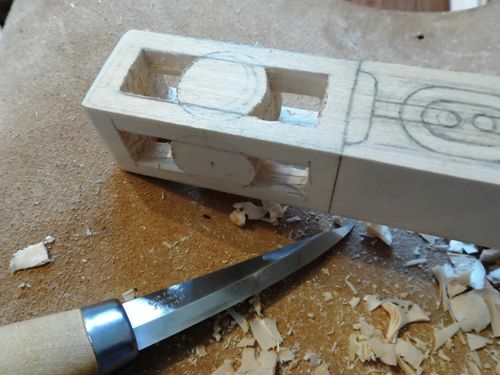 Eugene – The templates are a good idea, although if I do it again I would allow a bit of wiggle room in the arc template because it is impossible to carve a perfect sphere. 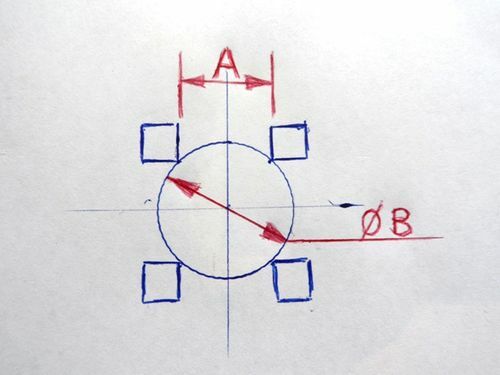 I would subtract 2mm from the diameter of the ball and cut the arc based on that circle. an amazing project. 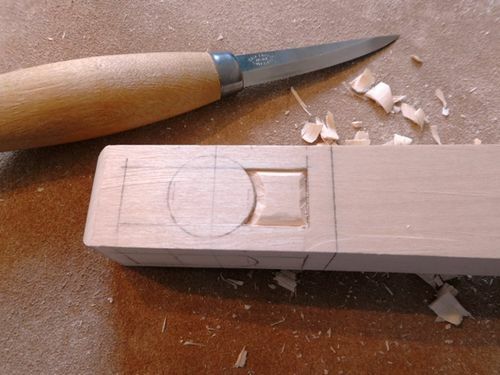 What type of wood are you carving your spoon from?